Nowadays, it seems like you can’t swing a dead mummified cat without hitting a book involving monsters, vampires, or zombies. That’s why it’s so important to call attention to a book that stands out from the pack with a great read with a good story. Night of the Living Trekkies delivers on both counts, and does so by bringing us the scariness of zombies and the sci-fi goodness of Star Trek. When these worlds collide, the reader will always win (at least when Shatner’s not involved). What is Night of the Living Trekkies about? Jim Pike was a huge fan of Star Trek and the ideals it promoted, but after spending time fighting in Afghanistan, he is disillusioned with humanity. Still, life works in mysterious ways, which is how Jim ends up working at the Botany Bay, a hotel in a Houston that hosts GulfCon, a large Start Trek convention. As he prepares to face hordes of people dressed up like Klingons, Ferengis, Federation crew, and other more obscure characters from the Star Trek universe, he figures the worst he’ll face is keeping an eye on his sister and her new boyfriend. Meanwhile, in a bunker outside of Houston, a military science experiment goes horribly wrong. The military thinks they have been able to contain the situation by blowing up the bunker, but strange behaviors by locals and news stories coming out of Houston confirm the worst. There are zombies in the city, and they are infecting everyone they can find. When the zombie menace reaches the Botany Bay and GulfCon, Jim and a rag tag group of convention goers must work together to escape to safety and cheat the ultimate no win scenario. Let’s start with the book’s plot. I’ll be honest that I wasn’t sure what to expect when I started reading this book. There was a part of me thinking it would be a Star Trek story (full of Star Trek hokeyness) with a little bit of zombies sprinkled in. Instead, the book has a well thought out plot that would have worked well even if there was no Star Trek (though that’s what makes it extra special!). I even liked the explanation of how people were zombified because it fit in great with the story and plays a key role in moving the action along. The Star Trek influence was found throughout the book, like the chapters being named after Star Trek episodes or the hotel bearing the name of Khan’s ship. The best part is that you don’t have to be a Star Trek fan to get the reference or the joke, there’s even some explanation provided when it’s one of the more obscure references. The authors even got in some Star Wars references, and it only made the story that much funnier and interesting to read. The writing and character development was also well handled by the authors. One of the best parts of the story is seeing how Jim starts the novel and changes during the course of the book. It was very natural in the flow of the story and had me rooting for Jim by the end. The supporting characters were also fun to read and helped move the story along, providing comic relief where needed. 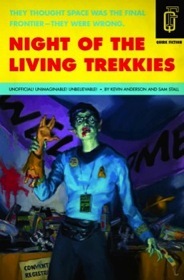 Who should read Night of the Living Trekkies? Obviously, this book would be a great read for fans of Star Trek and zombie novels, and would be fun for those who’ve read other books published by Quirk, like Pride and Prejudice and Zombies or Sense and Sensibility and Sea Monsters. Even if you’re not a fan of science fiction, I think you’ll enjoy this book as much as I did.